6 x 8 Heavy Gauge Steel Floor Register Discounts Apply ! 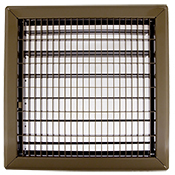 This heavy duty metal vent is a commercial grade steel register by Hart and Cooley. The brown floor vent has a sturdy construction and commercial grade strength, allowing for effective product performance even when placed in areas where there is heavy foot or wheeled traffic. It features a toe-operated adjustable damper for easy air flow adjustment, and has an air flow free area that averages 75%. This commercial grade steel register is a special order item and is not stocked in our warehouse - please allow a few weeks for item to arrive. Hart and Cooley also manufactures heavy-gauge steel floor grilles. Regarding measurements: Ensure you are measuring the actual size of the floor hole into which this vent will be placed. In order to have the correct vent size, please do not measure the faceplate of the old register. For instance, if floor hole size is 6 x 8 inches, please purchase a 6 x 8 inch register. Faceplate dimensions are 7 13/16 x 9 13/16 inches. The damper drops down into the hole opening approximately 2 7/8 inch and has an approximate faceplate thickness of 3/16 inch. See enlarged photo for register and damper detail.